We are currently looking for the following skill sets. We offer great referral bonuses, too! We are pro-actively searching for experienced consultants with automated testing experience within an Epic environment for a client on the East Coast. 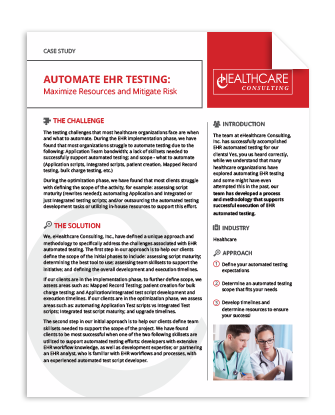 If you have experience doing automated testing with Citratest or any other automated tool within any of the Epic modules please reach out to lbeyer@ehealthcareconsulting.com for more details. We are pro-actively searching for experienced Epic analysts. To learn more about this and other positions, contact lbeyer@ehealthcareconsulting.com for more details. Openings at our company change on a regular basis and we are always looking for strong consultants with a wide array of experience. If your skill set isn’t listed but you are interested in learning more about our team, please don’t hesitate to email your resume to lbeyer@ehealthcareconsulting.com. Thanks for looking! eHealthcare Consulting is a family-based company that prides itself on treating all of its employees as family. Are any of these opportunities calling your name? Start planning for a better future now. We provide both ambulatory and inpatient solutions. All of eHealthcare Consulting's services are carefully tailored to fit the needs of your unique organization. Practice Managers – Seriously How Are You Keeping Up? MIPS is Easier – Say WHAT?!? PCMH – What’s In It For Me?